Wouldn’t you love to know what vegetables to plant when, in Southern California’s year-round growing season? Wouldn’t you love to have that vegetable gardening info in your pocket, even when you were out in your garden? VegGarden365 (app for Android phones) is available FREE on the Google Play Store. Here in Southern California, we can pull in awesome harvests 365 days a year … if we plant with the seasons. And for that, you’ve got to know optimal planting times. Not the info printed on the backs of commercial seed packets that’s written for someplace else, but tried and tested seasonality that fits with the relatively gentle winters and blazing summers we have in Southern California. So often, you’re out in your garden with the packet of seeds and that important info is indoors … and your feet are muddy … and you’re not sure where it is on your desk anyway. What if it was right in your pocket all the time? VegGarden365 is a FREE smartphone app that tells you WHAT TO PLANT WHEN in Southern California. Written by Joanne Poyourow of the Environmental Change-Makers, it is the summary of more than 8 years growing at the Community Garden at Holy Nativity in Westchester (Los Angeles 90045), plus nearly three decades of vegetable growing experience. All in your pocket. For free. With VegGarden365, you can find out which vegetables are best to plant this month. Or next April. You can find out when to plant peas, and when is the best time to plant tomatoes — here in Southern California. VegGarden365 is a tool which can help you with all your garden planning, indoors or out, and even on the go. With VegGarden365 in your pocket as you browse the garden center, you can tell in an instant whether the vendor is trying to sell you out-of-season vegetable starts. You can buy wisely and plant for success! 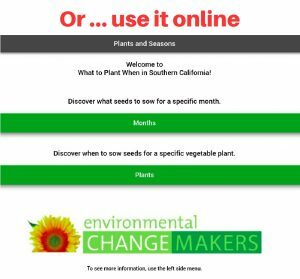 For years, we have circulated a free info sheet “What to Plant When in Southern California.” It has been very popular, and we even translated it into Spanish. But in keeping with the electronic age, we created an app. We did it because we’re passionate about growing food. And we want to make it really easy for you to do it too! It took years for us to discover all the info that is contained in this app, but we want to put it all in your hands. 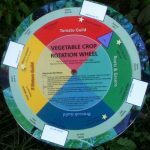 We want to help you become a successful vegetable gardener, quickly and easily. So … what will you be planting this weekend? Download VegGarden365 and find out!